Lauloa Oceanfront Condo is located on the north end of beautiful Maalaea Bay in South Maui, fifteen minutes from the Kahului Airport (Maui's main airport), and twenty minutes from the popular resort areas of Lahaina, Kaanapali, Kihei and Wailea. Our condo is only 20 feet from the oceans edge with spectacular, unobstructed views. Lauloa is located off a small street a good distance from the Highway and is very quiet. Typically the only sounds you hear are from the surf or tradewinds blowing through the palms. Maalaea Village is located with in walking distance from Lauloa, where you can find a deli, a general store, four restaurants, shopping center, and a miniature golf park, all situated around the small boat harbor where you can hop on a boat for fishing, snorkeling and whale watching tours. The latest addition to the village is the Maui Ocean Center which is Hawaii's newest and largest ocean aquarium and marine educational center with displays. During spring and summer one can often find good waves for bogey-boarding and surfing right out the door. Shore fishing is also possible. During the winter months you can view the humpback whales right from our oceanfront condo, it truely is amazing! Our beautiful condo on Maalaea Bay was our first home on Maui. We loved living there, however after having two babies and running a home business we felt we needed some extra space. We moved to a home in Wailuku, only 10 minutes away. We choose to buy our first home in Maalaea, because we loved living right on the waters edge. During Whale season we can see them everyday and hear them from our bed at night. In the summer Maalaea gets some of the best surfing waves in the world. The tradewinds blow most of the time keeping it much cooler and comfortable than say Kihei or Lahaina. And being centrally located on the island, you're not far away from anything. We stayed in this unit and the entire experience was wonderful. We worked with the owner Eva and she was very professional, kind and wanted to make sure our every need was taken care of . We were a little worried about the location and the wind in the area and we happily surprised that the location was so easy to get to both sides of the island with ease and the wind was never an issue . Condo was immaculately clean , beds and linens were plentiful and great quality. The real reason to go to the island ,which is the water view , was just outside your door and I can’t imagine being any closer to the waves and the abundant turtles . I have never left a review before , but I felt compelled to praise this homeowner and say thanks !! The pics do not really do it justice because when you walk in the view can not be captured thru a lens . It is not a new condo complex ,or unit , but the grounds , golf course grass right outside your door and well kept pool are in immaculate state and I will definitely be staying again . Thanks Eva ! We loved our stay in Maalaea at the Lauloa Condos. We spent most of our time there out on the lanai, enjoying sun and sea. Almost everything we needed was in the condo. (We did buy and leave a set of measuring cups and a couple beach towels and left those). The location is great - central to everything without being in a crowd all the time. Wonderful condo! Uncluttered & Clean with a couldn’t get better view & location! Loved it! We have stayed in many condos on Haouli Street over the years. Eva’s condo is the best by far! Well equipped,clean, uncluttered,comfortable, & the first ever to have ample room for visitors in the kitchen for groceries & both bedrooms for clothing etc. yet has everything you need. We love ground floor units both for the extra space & the convenience & the view here couldn’t be better. Already booked again for next year. We stayed in Eva's condo in mid-January 2019. 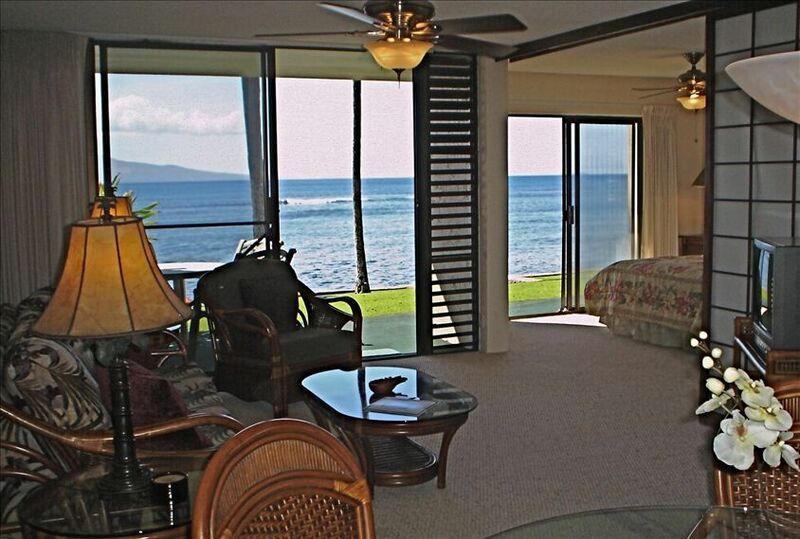 The view from lanai, living room and master bedroom is exactly as shown. From the lanai to the sea wall, it is only about 30', with well-kept grass, palm trees then the ocean. Sitting or standing on the lanai or sea wall, we saw humpback whales and sea turtles in Maalaea Bay almost every day. I cannot adequately express how fulfilling that experience was. The condo is located in a small, quiet line of condos and the town of Maalaea is quiet yet has a couple of restaurants and a general store that also has a grill, coffee and smoothies. The Maui Ocean Center is within walking distance and is a must see. One word of caution: This is a great place for adults and older children; I would strongly discourage families with young children due to the sharp drop from the sea wall to the rocks below. Please do not let this discourage you from this perfect location unless you have young children. We would surely stay here again. Loved the location. Condo was amply stocked with everything we need. The weather was not on our side though. Only saw one sunrise because of clouds. Maui Ocean Aquarium is just a few blocks away & 15 minutes from the airport. The ocean wall, just outside our room is very rocky. Nice to hear the waves. Little black crabs all over the rocks. Sandy beach is just a few blocks away at Haycraft Park, the end of our dead end street. Check out Coconut Fish Cafe in Kihei.. best fish tacos you will ever have. We saw Steven Tyler there on a Wednesday afternoon. We survived the road to Hana on Friday. Not that bad and very beautiful. A CD, on the TV stand, playing in the car guided us all the way to the seven sacred pools. We recommend using the CD for the drive. Grocery stores close in Kihei, The Times is a little more expensive than Safeway. Loved ABC souvenir stores and the the Craft flea mart in Kihie. Overall we had a super time .